A peaceful uprising against the president of Syria just over eight years ago turned into a full-scale civil war. The conflict in Syria has left more than 350,000 people dead, devastated cities and has forced hundreds-of-thousands of people to flee the country. All We Can has been working in the Middle East in countries including Syria, Jordan and Lebanon over the past seven years to support Syrian refugees. Irbid, a region of Jordan that neighbours Syria, hosts many Syrian refugees. Many fled their homes in 2012 and sought refuge in Jordan. Children like Sundus found themselves growing up in a new town and a new country and life as a refugee comes with many challenges. 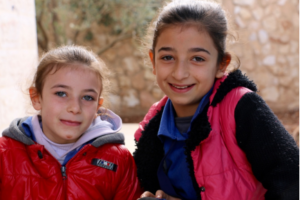 All We Can has been supporting programmes in Jordan to assist children like Sundus with special classes to help them deal with difficult emotions. Additionally, All We Can has been supporting adults with special training in small business skills. Sundus’ mother was able to benefit from a sewing course run at the community centre while her daughters were in their special classes. She was really grateful for the two days a week where she was able to develop a marketable skill that will enable her to run her own small business. All We Can is committed to continuing to support Syrian refugees living in Jordan.